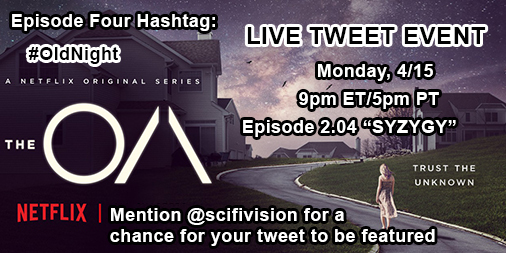 For episode four, we're once again coming together for a live tweet event for episode three, "SYZYGY". Please take note of the new weekly hashtag, #OldNight. You probably know the drill by now, but if you don't, read on. When a streaming service drops episodes of a series, it's hard for fans to know when to tweet; not everyone watches the whole season at the same time. Sometimes selected times are scheduled. SciFi Vision has decided to host its own fan events for the series. It would be great if you could join, but even if you can't, reposting would be very helpful to help spread the word. Not as many people knew about the first one, but since then, people have responded, and we have already received quite a few RSVPs. The event for the fourth episode will take place Monday, 4/15 at 9pm ET/5pm PT. A Twitter RSVP would be appreciated! A unique hashtag (this time #OldNight) is chosen to use during the event to try to get it trending and also for the purpose of being able to follow that particular conversation only. We have decided this time to use it along with official hastags for more promotion, so hopefully more people see it. Also, please tell as many people as you can about it!